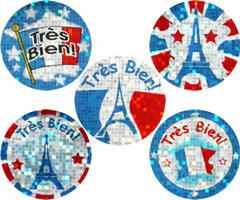 A range of French Reward stickers, each featuring a fun sparkling design together with a message written in French for praise and encouragement. 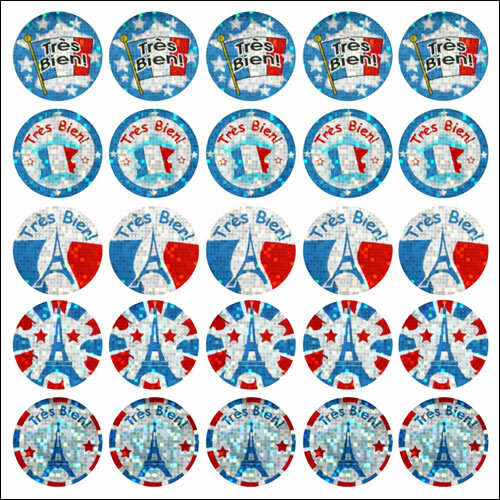 These French sparkly reward stickers are essential for every primary MFL teacher! They are an ideal size for children to stick onto their clothing. I used this set for a special French day ( Bastille day celebrations ), as small prizes. A bit expensive for every day rewards but the children loved them on the day. The children loves these designs that sparkle. A special treat for the youngest! The kids love them and love the chance of being a French sparkly star - they recognise the phrases and all work really hard to receive these - excellent! The kids I teach love these stickers... from the 11 year olds... to the 18 year olds! Great! The children love them and that's the whole point! Nice and eye-catching but would have preferred them to be a little larger. These stickers are excellent, my pupils love them. Hopefully they will also help them to recognise the shape of France! I have been volunteering teaching French to children age 3 - 5 at my son's school and they are so excited to get a "sparkly" sticker when they do things right. These stickers are especially great as they stand out from the others.